Recently I went with friends to my favorite restaurant. I love the Prime Rib they make. That particular day they were out of Prime Rib. So I decided to go healthy and order the Popeye salad. It was a splendid salad with lots of fresh strawberries, blue cheese, walnuts with a tangy balsamic vinaigrette. 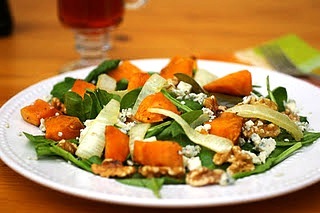 As I ate my salad I thought how good it would be if I made it with sweet potato. That is how this salad was born. A couple of days later I decided to make it. It was just as good as I imagined it would be. Definitely going to add this to my sweet potato-palooza experiments. I love blue cheese and balsamic together. 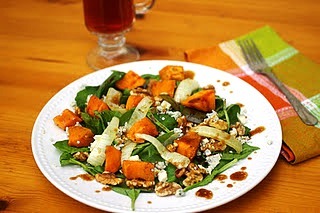 I would not have thought to use sweet potatoes in a salad but this sounds delicious!!!!! The salad looks delicious, Veronica. The sweet potato paired with blue cheese is just perfect. Add the crunch of the walnuts and heaven opens. Yum.